Master Naturalists are a curious bunch and ask our hike leaders and instructors a ton of questions. 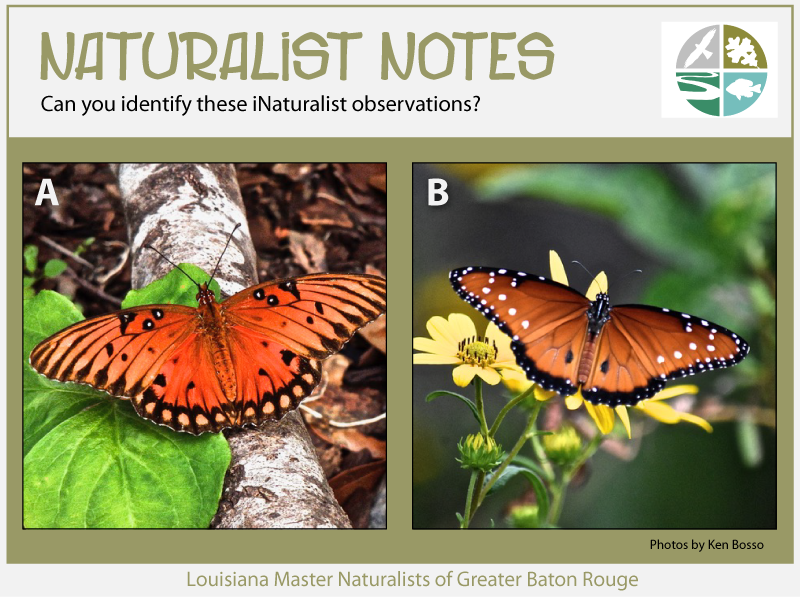 Below you will find some answers to some of our most frequently asked questions that come up as we explore Louisiana's ecoregions. 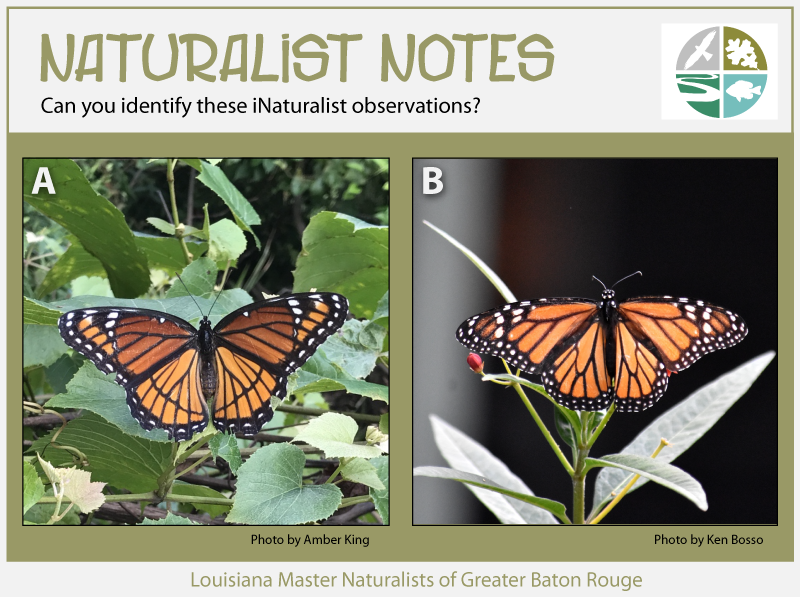 We encourage using iNaturalist to record your observations of nature - the data is very valuable to scientists because it documents species and the phenology (blooming, fruiting, larvae, adult, etc.) at a place and date. 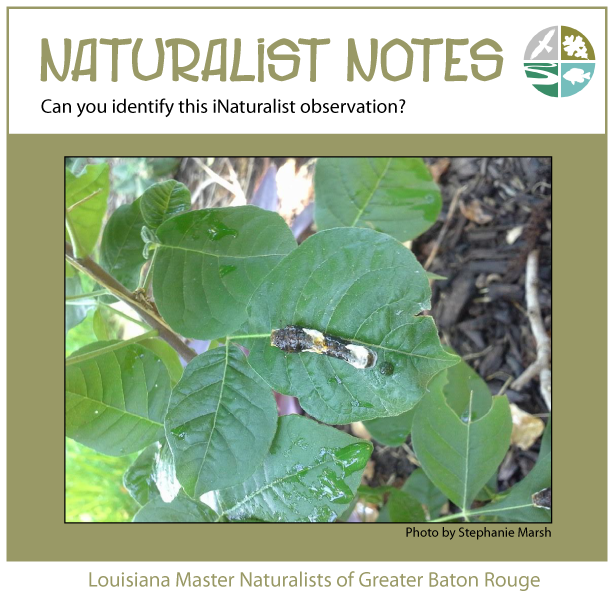 Plus, it is a great tool to learn the identification of Louisiana's wildlife and plants. Wing undersides are brown with silver spots. Wing undersides have black veins and white spots. No Monarchs here, but they sure look very similar! Gulf Fritillary butterflies are unique to the Gulf of Mexico area. They rely on Passionvines to lay their eggs. Plant a passion vine in your garden and you will surely have some spiky orange and black Gulf Fritillary caterpillars in no time! You will often see the adults getting nectar from Lantana. Queens are tropical butterflies that are cousins to Monarchs. They lay their eggs on Dogbanes like milkweed and jasmine. The adults like to get nectar from a variety of plants, like milkweed and mistflower. Even poop is interesting to naturalists! In this case, it is not poop, but a caterpillar. Check your satsuma trees and other citrus plants for these fascinating larvae that mimic the coloration and shape of bird droppings. Great camouflage from predators! These caterpillars can stick out a forked osmeterium that looks like a snake tongue to fend off predators. There are also species of moths, spiders and frogs that mimic bird droppings. Larvae sticking out the osmeterium. Adult ovipositing (laying eggs) on a satsuma tree. This is a non-venomous Broad-Banded Water Snake. Water snakes are very often mistaken for Cottonmouths. Both snakes are similar in size, have big heads and varying colors and patterns. Both species are vital to our ecosystem and are best left alone. Tends to swim with its body under the water. Eyes relatively easy to see from above. Head is more rounded and snout is more pointy. But, when scared, they can flatten their head and mimic a viper! Tends to flee into the water to escape; Will strike if threatened; Does not vibrate tail. Horizontal dark stripe across the eye. Tends to swim with its body on top of the water. Eyes have a protective ridge above them. Head is blocky; Head is wider at the neck than a water snake. Tends to stand its ground and try to scare you away by vibrating its tail and opening its mouth, which is white inside; Generally will not strike unless handled or stepped on. Venomous Snakes of the Southeastern U.S. 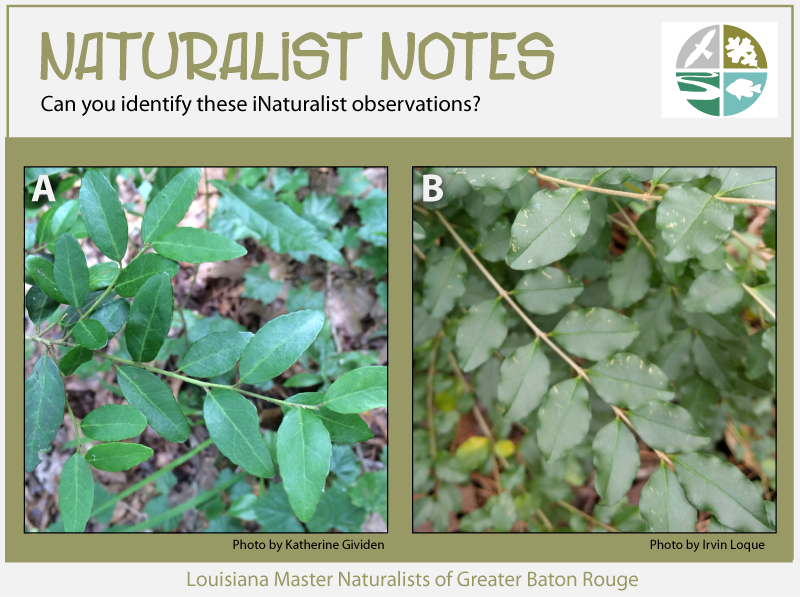 These two lookalike shrubs are very common in Louisiana, but are very different in how they impact the ecosystem. 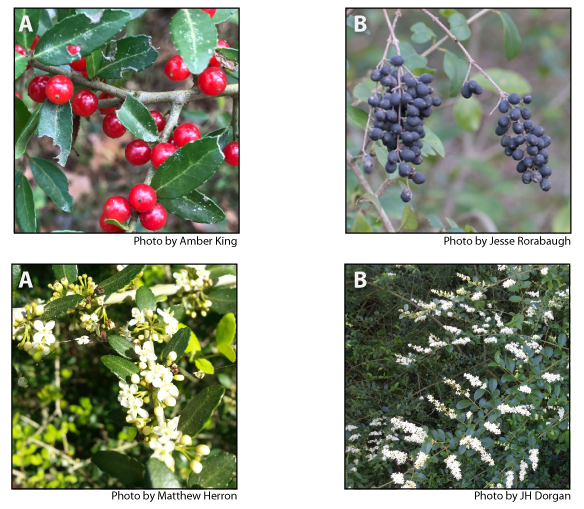 Privet is extremely invasive, quickly invading forests from the berries and spreading roots. It disrupts the ecosystem by out-competing and shading out the native plants and trees. When you are out in the field, the most obvious difference is the black line that runs horizontally across the hind wings of the Viceroy. Monarch caterpillars feed on milkweed as a defense mechanism because it makes them (and the adult butterflies) poisonous and taste bad to predators. The viceroy also tastes bad because it feeds on willow and cottonwood, but it is not as potent as the monarch. The viceroy and a few other butterflies mimic the look of monarchs, and as a result, predators will usually avoid all of them. 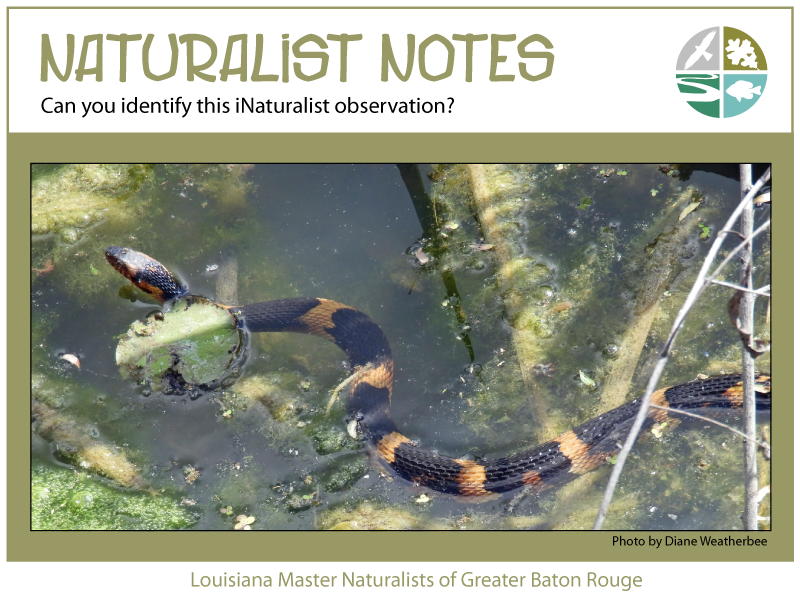 Try loading observations from your yard and outings onto www.iNaturalist.org! ​It's a great way to identify the wildlife and plants in your ecoregion and contribute scientific data.